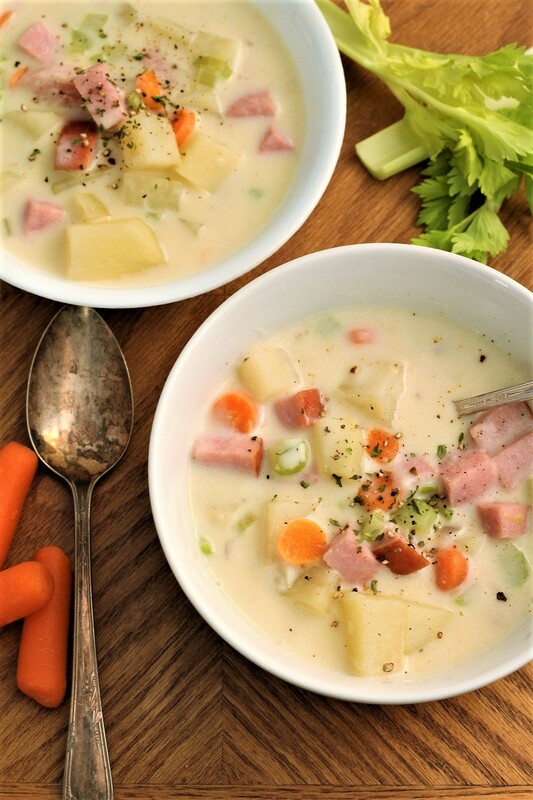 Potato and ham soup is a wonderful creamy soup that you can make in 30 minutes or less. I love that you can use left over ham, fresh potatoes, celery and carrots. Why not give it a try today? It makes a nice pot of soup, and the flavor is very rich and good. So my son that is just a little picky, or a lot picky, said to me tonight. “Wow, this is good soup”. We also had some steaks that have been in the fridge for a week, I got them on mark down and so my husband put them on the traeger. My son told me that they were both so good that we should open a restaurant! Now that is a pretty nice compliment, I think. Sometimes when I go out and eat, I tell myself that the food I make tastes better than what some restaurants make. As I am typing this, my daughter asked me where the rest of the soup is? I told her that I took it to the neighbors and she told me “Rude”. Then she told me that she liked it too. So when you get a good from two kids and one husband, it is a keeper. 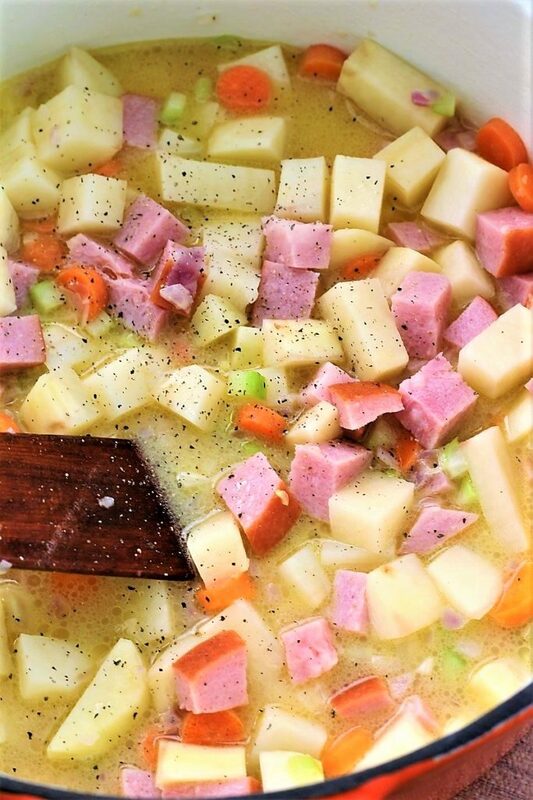 I bet if you make potato and ham soup, that your family will like it too. I had a ham in the freezer, and I decide that I needed to use it up. So, I pulled it out of the freezer and put it in cold water for a couple of hours. Then I put the butter in the pan and sauteed the onions and garlic, then I added the celery, carrots and the potatoes. I also tossed in the ham. Then I put in the broth and flour. After about 15 minutes, when the potatoes were soft, I added the milk. Also my potatoes were my nice big Idaho potatoes, so I only used two potatoes. And I would have used a couple of large carrots, but I didn’t have any so I used small ones. And the soup was wonderful. In a large kettle place the butter, onion, and garlic, and saute them for 2 minutes. 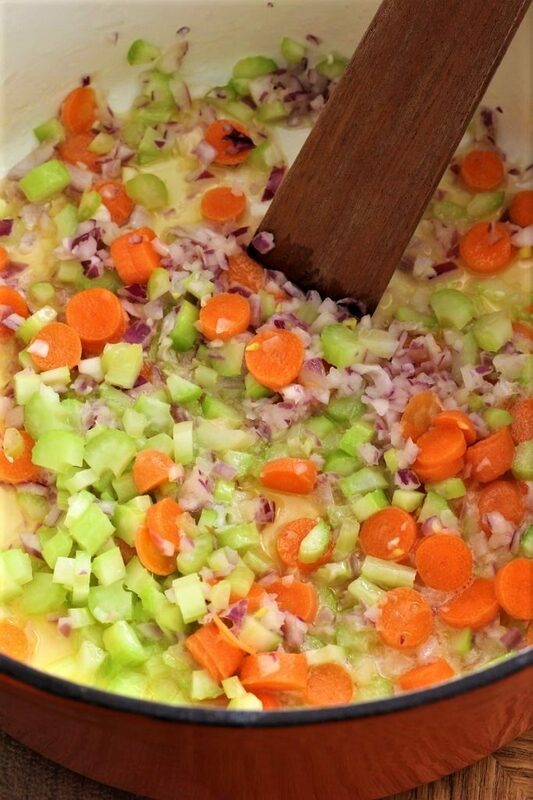 Then add the carrots and celery, and saute them for 3 - 4 minutes more. Toss in the ham and potatoes and cook for 1 minute longer. Stir in the flour mixing the whole time. Add the broth, Better than Bouillon, and the pepper. Allow to cook over medium heat until the potatoes are tender. Add the milk and allow the soup to thicken on medium heat, about 7 - 10 minutes. Garnish with pepper and dried parsley. This looks so comforting and delicious, perfect for a cold and blustery day like today! Such a hearty and thick soup! The perfect meal if you ask me 🙂 I need a huge bowl of this right now to warm me up! It is slick and cold here. I wish I could bring you a big bowl. Thank you for all you do!